two hours later the publix theatre caravan was requested to leave the square by the head of security of the dokumenta 11 under the pretext that: 1) the performance was a threat to public security 2) it was unauthorised. despite the support of dokumenta 11 personal and passing public the publix theatre caravan was threatened with forcefull eviction, detention and the confiscation of the media bus. the police then demanded identification. 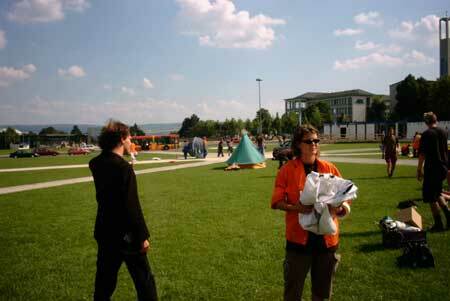 further more, a proposal for a compromised solution and theatrical intervention at the curators office were ignored.four hours later the publix theatre caravan was forced to leave by the police.in spite of this the caravan will continue to operate in kassel in the next days, reclaiming freedom of art and freedom of movement. the right for freedom of movement has become an essential demand of political and cultural groups. 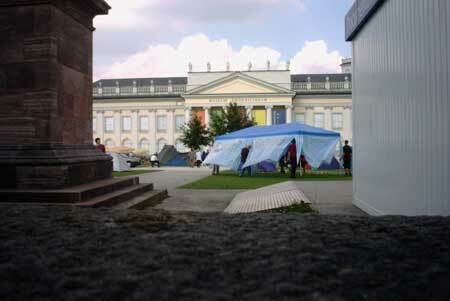 the international no border camp in strasbourg was a ten day laboratory for creative resistance and social disobedience and self organisation in accordance to the formentioned topics. 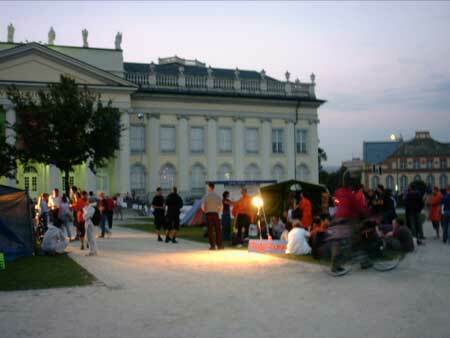 the no border ZONE is the follow up project of the no border tour 2001. the publix theatre caravan is installing temporary autonomous zones, experimenting with identities and non-teachable bodies in virtual and public spaces. the main topic is the policy of fortress europe and specificaly the sis (schengen infromation system) which is situated in strasbourg. it is well known that the databases of the sis already controls the migration in to the european union. now it has also been extended to include data about politicaly dissenting groups/persons. the artivists theatre media project , no border ZONE investigated strasbourg city according to the crtiteria of bio political systems, mapped public spaces, collected information about the composition of the bio police and electronic substitutes for borders. in conclusion: this data has been connected to the sis and in doing so has made the system accesible to all. the connection between phyisical and virtual space and the links between political and artistic systems are the main focul point of the project no border ZONES. last but not least we highlight the connection between artistic and political spaces while visiting the documenta 11.
at the dokumenta platform no.1 in vienna in 2001 the publix theatre caravan presented the nomadic theatre media project no border no nation(www.no-racism.net/noborder tour). in june 2001 the caravan was arrested during the repression surrounding the g8 summit in genoa and subsequently spent three weeks in jail. (the artist lisl ponger documented the locations previously visited by the caravan. this exhibition can be seen in dokumenta 11 in the kulturbahnhof) by the end of this year it will be decided if the caravan will be brought to trial accused upon suspicion of memebership to the so called "black block" and the destruction of the city of genoa. after the expulsion from the centre of strasbourg - the prefecture forbid all no border actons in the city and has favoured repression over freedom of movement, once again in kassel we face a similar story - the publix theatre caravan will continue the no border ZONE here in kassel.